Amyloid aggregation is a phenomenon in which normally soluble proteins assemble into long fibrils, implicated in a variety of diseases, including Alzheimer’s, Parkinson’s and Type II diabetes. It has proven to be very challenging to characterise the mechanisms of its formation, whose understanding is however crucial for influencing the pathological processes in a rational manner. In this case, computer simulations can provide invaluable insight. Using a simple coarse-grained model, we can reach large system-sizes and long time-scales, in order explore mechanisms of amyloid formation under physiologically relevant conditions. Substantial evidence shows that disordered pre-fibrillar oligomers – but not the fully grown amyloid fibrils – are cytotoxic and involved in pathological processes. Yet, their relationship to fibrils is not well understood. 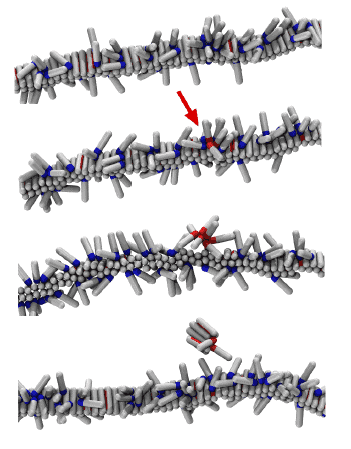 We showed that at physiological conditions, small disordered oligomers are on-pathway to amyloid formation, and serve as nucleation centres for fibrils. There is an optimal oligomer size for amyloid nucleation, and classical nucleation theory cannot be applied to this process. Simple computer model of amyloid aggregation at physiological concentrations. Left panel: Solution of amyloidogenic peptides. A peptide oligomer is circled in red. Right panel: Peptides aggregated in amyloid fibrils. Recent experiments have revealed that amyloid fibrils are able to catalyse formation of their copies from soluble peptides. However, the mechanism is unknown. 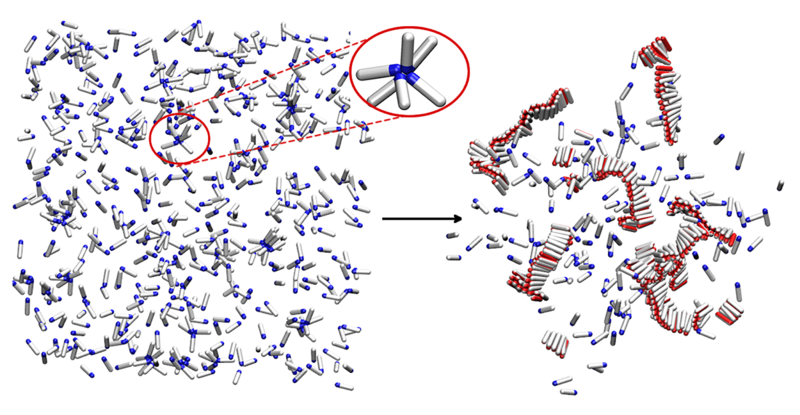 By combining coarse-grained simulations and kinetic theory, with biosensing experiments and kinetic measurements of Alzheimer’s Aβ40 peptide aggregation, we proposed an elegant mechanistic explanation for the self-replication of protein fibrils. We find that the process is governed by a single physical determinant − the adsorption of monomeric proteins onto the surface of fibrils. Mechanism of the fibril self-replication. A. Šarić , A. K. Buell, G. Meisl, T. C. T. Michaels, C. M. Dobson, S. Linse, T. P. J. Knowles and D. Frenkel, Physical determinants of the self-replication of protein fibrils, Nature Physics 12, 874 (2016). (Cam Research News, UCL Research News, Media). Free view-only version.